Book Giveaway – GREAT MORNING! 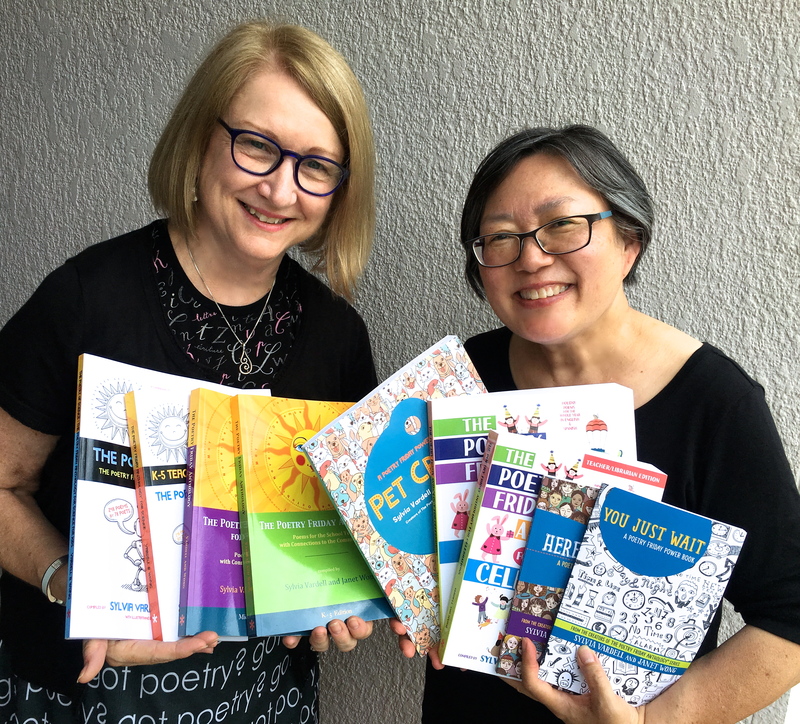 Sylvia Vardell and Janet Wong have a new book of poetry—for principals! GREAT Morning! 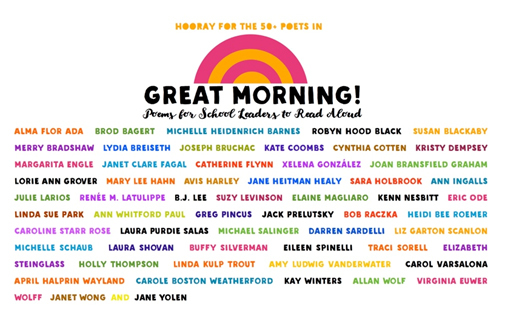 Poems for School Leaders is their brand-new anthology of 75 poems by 50+ poets. Three lucky people will win a copy each. For a chance to win, leave a comment—or reblog, tweet, or mention this post on Facebook with a link for additional chances to win (let us know in the comments where you shared this post). Next Friday, check here to discover the winners. Create a school culture of positivity using poetry as a tool! These poems are short and easy to read; they take just a minute to share. Readers can be principals, student leaders, office staff, custodians, lunch staff, specialist teachers, parents, and community guests. Transform your regular “good morning” welcome into something fun and inspirational—and make any morning a GREAT Morning! 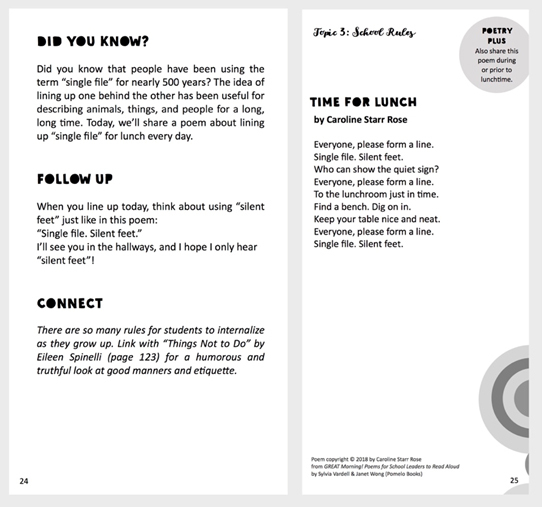 This book aims to contribute to a positive school culture that emphasizes kindness and respect with morning announcement poems that have intriguing “Did You Know?” intros and engaging “Follow Up” closings. Elementary school principals are envisioned as the primary readers of this book, but guest readers can include the office staff, lunch staff, nurse, custodian, volunteer parents, local celebrities, and student leaders. 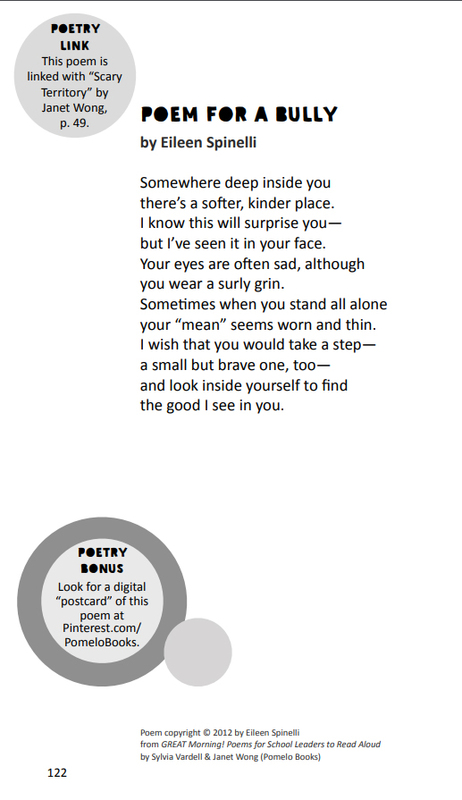 The “linked poems” identified in the “Connect” sections are ideal for teachers, reading specialists, and librarians to share along with “Hidden Language Skills” for each poem that present interesting tidbits about punctuation, capitalization, or poetic forms and techniques. 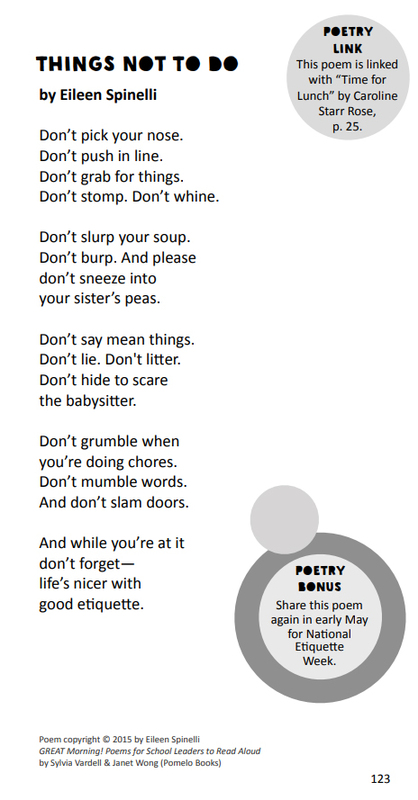 Here’s an example featuring “Time for Lunch” by Caroline Starr Rose, linked with “Things Not to Do” by Eileen Spinelli. For years, teachers have been using poetry to engage children—and not just in language arts. Poetry is a great tool to introduce vocabulary and reinforce concepts all across the curriculum, especially in social studies and science. We started asking ourselves: how can we harness the power of poetry to make positive changes school-wide? And the answer was: start at the top—at the beginning of the day, with the principal. When children hear poems over the morning announcements, they get the message loud and clear: poetry has power! We started by making a list of topics: school forms, safety, transportation, rules, inclusion, diversity, health and wellness, leadership and respect, gratitude, and so on. We originally envisioned a much smaller book. In the first few drafts, the only poems in the book were poems written by Janet. In later drafts, though, we started including exemplar poems that had appeared in previous books from The Poetry Friday Anthology series—and that were right on target in terms of our themes. Ultimately we decided to expand the book in order to include brand new poems, as well; the next thing we knew, our book was twice as large as we’d envisioned. And yet there still are many, many poets we wish we could’ve invited as contributors; we now have approximately 175 poets represented in our books! Sylvia Vardell is Professor at Texas Woman’s University and teaches children’s and young adult literature. She has published five books on literature, plus more than 25 book chapters and 100 journal articles. Her current work focuses on poetry for young people, including a blog, Poetry for Children. Link: http://poetryforchildren.blogspot.com/2018/07/good-morning-no-great-morning.html She lives in Dallas, TX. Janet Wong link: http://www.janetwong.com is a graduate of Yale Law School and a former lawyer who became a children’s poet. Her work has been featured on The Oprah Winfrey Show and other shows. She is the author of 30 books for children on identity, chess, creative recycling, yoga, and more. She lives in Princeton, NJ. Sylvia Vardell is Professor at Texas Woman’s University and teaches children’s and young adult literature. She has published five books on literature, plus more than 25 book chapters and 100 journal articles. Her current work focuses on poetry for young people, including a blog, Poetry for Children. Link: http://poetryforchildren.blogspot.com/2018/07/good-morning-no-great-morning.html Her favorite pets are dogs and she’s had three of them (Luther, Yenta, and Caesar, each for many years), as well as Leonardo the tortoise, and Pecky the parakeet. She lives in Dallas, TX. Janet Wong link: http://www.janetwong.com is a graduate of Yale Law School and a former lawyer who became a children’s poet. Her work has been featured on The Oprah Winfrey Show and other shows. She is the author of 30 books for children on identity, chess, creative recycling, yoga, and more. She has had dozens of pets, including birds, fish, a frog, hamsters, lizards, turtles, a cat, and favorite dogs named Bernadette, Coco, Nissa, and Angel. She lives in Princeton, NJ. Together, Vardell and Wong are the creative forces behind The Poetry Friday Anthology series and the Poetry Friday Power Book series. You can learn more about their books at PomeloBooks.com. Books by Vardell and Wong have won numerous awards and accolades, including the ILA Notable Books for a Global Society (NBGS), NCTE Poetry Notables, Children’s Poet Laureate Pick of the Month, CBC Hot Off the Press, and NSTA Recommends. Thank you Sylvia and Janet for sharing your journey with us and offering one lucky winner a copy of your new book, GREAT MORNING! It would be great to win this book so I can gift it to a dear friend who is a new principal this school year. Congratulations! Such a positive way to start the day! I can’t read this one and share it with the principal at my kids’ school. So many great poets featured! I love the amazing books these two women keep creating. I would love to win this for my granddaughter’s charter school. Thanks for an interesting post and a chance to win. These poems really are GREAT, very inspirational. Thanks so much for the chance to win a copy of this book. 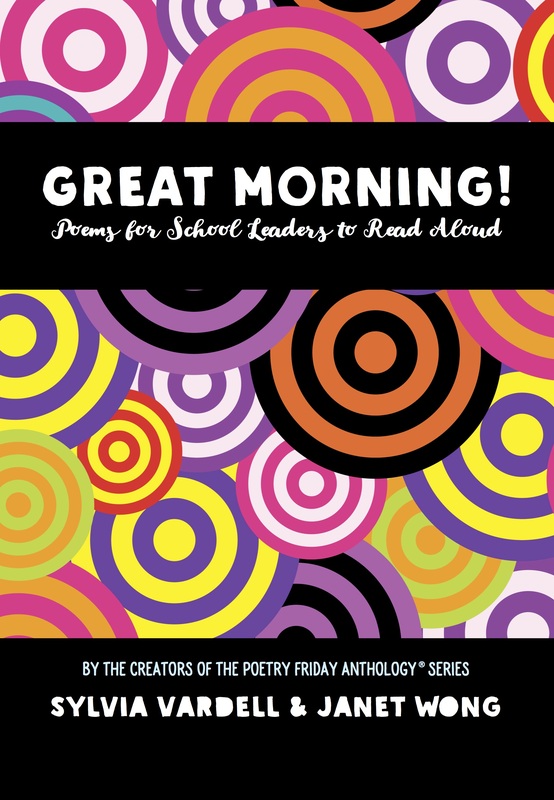 What delightful and helpful poems for principals, teachers, and kids! This is so clever for schools! I loved the samples! It would be so lovely to have a chance to read this book! Thank you for this post…I’m glad to have such a wonderful book brought to my attention. Loved the samples & the concept. What a treasure for schools everywhere.